As one of the premier sewer cleaning companies in New Jersey, at A1 Sewer Cleaning, we offer fast, effective emergency sewer cleaning for local homeowners and business owners. We have the experience and expertise to know how to fix your plumbing problem quickly and economically. Need a Sewer Cleaning Company in New Jersey? Call Us for 24/7 Sewer Service! Issues with your sewer main line can cause some serious resulting problems, including backed-up sewage and waste water, perpetually clogged sinks, drains, and toilets, and even serious flooding. Getting serious sewer problems taken care of as soon as possible can prevent costly water damage to your property, and it’s important to call immediately for sewer line cleaning. If your sewer is backing up, call us now at A1 Sewer & Drain for professional emergency sewer cleaning in New Jersey. At A1 Sewer & Drain, we use the latest tools and technologies to safely, effectively fix your clogged or blocked-off sewer main line. 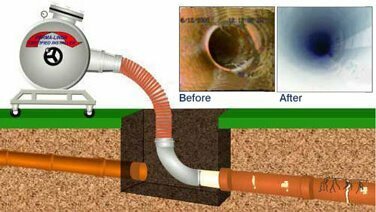 For sewer line cleaning, we use powerful hydro jetting systems to easily clear even the most stubborn tree roots, organic sludge, and other clogging material out of your sewer main line. To double-check the exact cause of the problem, we use advanced sewer camera inspection systems, developed by manufacturers like Insight Vision, CUES, and Aries Industries. With our arsenal of tools and extensive emergency sewer cleaning experience, we can handle almost any home sewer problem. If your sewer line is clogged or backed up, don’t wait for the problem to get any worse. Call us today at A1 Sewer & Drain for professional emergency sewer cleaning in New Jersey, at 201-645-0888.